Note to owners of the previous edition of this product: The significant changes in the new edition are that three cards now reference Perception instead of Spot, Search, and Listen; an "additional rules" card has been added with 3.5 usage notes and new optional rules; a couple of typos have been corrected; and the damage type labels on each card are now light yellow instead of red to improve readability. All of the cards with textual changes are pictured below. I've used the Critical Hit Deck in several hundred sessions of D&D 3.5/Pathfinder, and it's one of those little things that adds a lot to the game. Simply put, the deck is a lot of fun and makes a mundane crit into something memorable. With the deck, a critical hit doesn't just do extra damage anymore: it might make the opponent blind, start to bleed, fall down, or any of about two hundred other things! Each card in the 52-card deck has four critical hit effects on it, categorized by damage type (Blugeoning, Piercing, Slashing, or "Magic" for spells delivered with attack rolls). A fun bludgeoning effect might be "To Your Thinky Bits" which does double-damage and 1 Int bleed, while a magic effect might be "Vampiric Magic" that heals the caster the same amount of damage that the attacking spell delivers the target! I've found the effects to be well-balanced and reasonable within the mechanics of Pathfinder, and there aren't any effects that are permanent that don't allow for a saving throw. The deck also comes with two double-sided cards with instructions and optional rules that change how often players and the GM draw cards. If it sounds at all appealing, it's worth trying out for a couple of sessions--I'm pretty sure you'll be glad you did. This and its twin, the Critical Fumble deck, have become an interesting and enlivening adjunct to our group's gaming experience. We tend to believe that extraordinary circumstances should be, well, somewhat extraordinary. It doesn't come up often enough to make or break a game for us, but on the occasions when a draw from one of these decks becomes necessary, it does lend a bit of flavor to the experience. A former member of our group introduced us to them, and once he left we realized that we did rather like the decks. So now I've bought them, and look forward to using them once again! 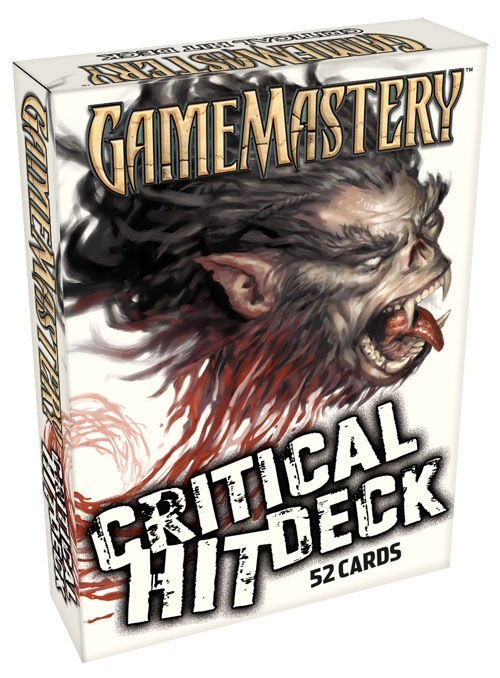 We're pleased to announce that a new edition of our Critical Hit Deck, updated for use with the Pathfinder Roleplaying Game as well as the 3.5 rules, will be available in March. A list of the changes from the previous edition is included in the product description, along with images of the seven cards that have had text changes. Achilles Tendon: has been changed to "Achilles' Tendon"
2 for 1: "one" has been added before "adjacent target"
Missing Digits: "looses" has been corrected to "loses"
Outstanding backorders for the previous edition will automatically be converted to this edition. sweet. cats knocked a soda onto my deck. We still use it, but they're a bit...stiff. Any hope for the fumble deck too? And maybe a way to order both at once? No plans for a bundle at this time... but it might be worth considering! Just one question, does "Stabilize" stop a "Bleed" effect? It's not technically a "cure spell" and doesn't give any h.p. but it replaces "cure minor wounds" that would stop bleed effects and has the same effect as a Healing DC 15 check. I ruled that stabilize would stop one condition per casting so either you stop the target from bleeding h.p., bleeding attribute damage or dying for each casting not all at once. I'd like to know how other people handled this. In the current rules, stabilize does not stop bleeding as it does not cure damage. This is something I will review. What are the chances of getting sort of a booster deck with the new PFRPG cards that can be added to pre PFRPG decks ? Not cost effective ? It's not exactly the same mechanics but the "...other healing magic" part could cover Stabilize since it's part of the healing sub-school. Does Slime has a grudge against elves (I remember his comments about their ears...)? Are you saying I confirmed my crit? I don't think very many people would think it's worth paying money for. Note that every card with a significant change is pictured above. Also when I said booster decks I meant brand spanking new cards to add to the originals; maybe 6 to 10 new cards for each new Adventure Path thematically linked to said AP. Yeah sounds like bad and wonkey trading card game already. I placed an order for this a few months ago is there any word if it will be available this month? i know, its just like having a director's cut DVD, then like a month or so later, they come out with an ultimate director's edition with more cool stuff. you've got the cool stuff already; but now there's a just *slightly* cooler version out there. It's supposed to arrive towards the end of March. Okay silly question: I have the older deck on backorder.. Does that mean I need to cancel this and pre-order this one, or does my old backorder work too? About stabilize, when a player used it to stop bleeding from a rogue's bleeding attack, I let it happen. I considered it too much of a waste of a standard action not to, and it seemed reasonable to me. We'll fill the backorders with the new edition. No need to do anything. And it sounds like they may actually be coming in this week! 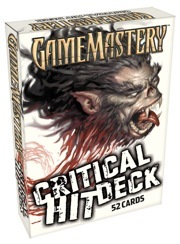 The Critical Hit Deck is back in stock! Order away! I love the critical hit and fumble decks. A great addition to any game. I have these cards, I won't buy it. Though I will say this if you haven't bought them already. They are the coolest thing I have ever seen. Buy them! Buy them now! I wish I could buy them again, but having the latest updated version would be totally cool. Can't you guys sell update packs??? Throw away these three cards and replace them with these ones.... I would buy them in a second. Maybe I will buy them at PaizoCon because there would be nothing else I don't have from you guys already. We've been using the deck for a while and liking it very much thank you, and I'm thinking of getting my own deck (the player who has the deck often forgets to bring it in). The only problem I have is that we're not sure what to do with critical hits when causing nonlethal damage (which is a problem for me as my character refuses to really hurt people unless absolutely necessary). Blunt crits seem often the better fit but a bunch of them are too destructive anyway. I'm guessing the deck won't be revised any time soon to add an extra category, so I'd like to know what other people have done faced with the same issue. A bad GM would say that a character refusing to really hurt people would not score a critical hit. An evil GM would apply the drawn card and say: "You now really feel sorry for breaking his knee-cap." I would probably allow to simply roll double nonleathal damage, without using the deck for that character. I had a new deck, and the old deck. I lost them both. I want to order the newer deck. How do I make sure I am getting the new deck since the cards on the site are the old cards? We are totally out of the old cards, so there is no way you can get an old deck! So order away! PS:No response needed, just felt the need to put that out there. Perhaps you could offer the two decks in a hard plastic case with a removable top. This would be attractive, keep the cards from slipping around (my one beef) and the lid could hold the used cards. Maybe even offer a fancy 'metal box' version for your more avid devotees. These cards are super fun! My group has enjoyed making crits even more since I've started using this deck for my games. I make somewhat of a production out of it by shuffling the cards and then fanning them out for the player to draw from. One of these days I hope to play in a game where the DM uses these. I've got an idea for a fighter dual-wielding kukri. Slice and dice! I just looked and noticed you didn't change stabilize to stop bleeding. Personally I would see that as exactly the point of stabilize, to stop someone from bleeding or their condition getting any worse. Oh, I also wanted to say that this is the greatest way I've ever seen for dealing with critical hits! Crit tables really just slowed down play, and the people that authored them often tried to get too detailed with them, adding bonuses or giving penalties on size and/or weapon type, etc. D&D is a game using an abstract hit point system, it follows that the critical hit system should have some abstraction as well. I can't wait to use these in my game. Now I may be completely blind or dense here, but when the card references dbl/normal/triple dmg is that standard weapon dmg, or critical damage? When it references normal damage, it means the normal weapon damage. You replace the double damage with the actual critical multiplier of the weapon (or draw more then one card, adding the resulting damage multipliers up), and when it says triple, it really means adding one to the weapon's crit multiplier (unless you do the multiple card method). I don't have this yet - but I love the idea of it! This is what made the Rolemaster system (way back in the 80s) such a complete blast to play! (along with critical fumbles). I'm very glad to see it rearing its head in D&D/Pathfinder! It would be a great idea to have a deck card as a GM to give to our players indicating the normal conditions, diseases and it's effects (3.5/PFRPG) and curses. I picked up this deck last night -- it's great. However, how does it work with spell casting? Does it only work with spells that act like ranged attacks? From the Pathfinder RPG Core Rulebook: "A spell that requires an attack roll can score a critical hit. A spell attack that requires no attack roll cannot score a critical hit." Awesome product! It's just the additional spice I needed to add to my game. Some items need "DM's discretion" dependant on what system you play, though it's an easy fix. 1) when a card calls for a save, what is the DC of the saving throw? 2) When you lose characteristics due to a crippling injury, how do you recover the points, just with cure wounds spells? If a creature gets hit for 1d4 dex damage it is a minor penalty for the 1-5 rounds it has left before the players kill it. In my game last night our centaur barbarian got a critical hit against a pit fiend. The extra effect was a 1d6 loss to dexterity. We rolled a 6, which dropped the fiend's AC by 3. The next round the only hits from the barbarian that connected would have missed without that AC penalty. It was a great fight, and even at their level (14) they still love drawing from this deck. 1) The DC is the confirm roll on the critical. 2) Usually the restoration spells are used to recover ability score damage. What's the point of this product in a deck of cards format? All the information's in text with no illustrations so it may as well have been a randomly rolled table. Similarly, you can easily customize your deck by removing any effects you don't like, without then having to either make up new ones or reroll when you hit those numbers. Mainly, though, drawing cards for the effect is fun. My house rule is if the damage type is listed as "X or Y", the player has to choose one before the effect is revealed. If the damage type is "X and Y", the player gets to read both effects before choosing one.